I was sad to leave Madam Bongo’s, but I was well-rested and dry. After saying goodbye to Mikkel, I headed off towards Raisajávri. It was a windy day, so the insects left me well alone. After a few hours, I met a couple on the trail heading north (PEOPLE!!!). They warned me about this river I was soon facing, told me that I might would want to turn around and walk along the road instead of crossing it. My intuition told me to continue, but the closer I got to the river, the more nervous I got. When I finally reached it, I actually laughed! Kaja-I’ve-faced-worse folded up her trousers and crossed it with ease. Cocky? Yes. Confidence boost? Indeed! The wind decided to take it up a notch, almost blowing me off my balance. But I didn’t complain once, because the wind is my friend now. When the rain started pouring down, however, I wasn’t too pleased. With the wind from the side, the whole left side of my clothes was soaked. Enduring this for two hours, I found a spot at the foot of the mountain and put up the tent. It’s the best feeling in the world to get out of your wet clothes and in to a warm sleeping bag. I have a knack of knowing when to get out of the tent and start walking. It can rain the whole night through, but when I start packing up, it always stops, always. It was a windy day, very promising. After an hour, however, the wind decided to go somewhere else and I was left to deal with the mosquitoes. They were surrounding me, and if it hadn’t been for my mosquito net, they would have eaten me alive, I’m sure of it. I guess I was quite a sight, out in the middle of nowhere and with a halo of mosquitoes… I wonder what they eat when they can’t have Kaja (or hobbits). A German woman I met gave up the fight against the insects and put up her tent. After 9 hours of pure struggle, I managed to crawl up the mountain side, where it was both cold and windy. The insects said goodbye and left to find another prey. Suddenly a mist came drifting in, making the landscape look very mystical. I love mist, and soon I was humming to myself instead of cursing, I felt light as a feather. In the mist, I couldn't see far ahead. Suddenly, I stumbled over a gathering of at least 20 tents. When it started to rain, I was inside my tent quick as a flash. Another rainy night made me somewhat demotivated, but after putting 5km behind me, I found myself safe and warm inside Nedrefosshytta, a huge cabin that lifted my spirit considerably. After an hour, all my clothes were dry, another hour later and my stomach was full of spaghetti. I was ready to walk on. I met two girls outside the cabin. They were waiting for the riverboat to take them up the river. Soooo tempting, but no boat ride for me. A little further up, I met three fishermen from Switzerland. They could inform me that the river had risen at least 30cm since yesterday because of the rain. The proof of that, met me soon enough. The trail was completely flooded several places, my only option was to find an alternative route. I had to fight my way through branches and bushes, climbing rocks, crossing waterfalls and avoiding fallen trees. The treacherous path led me to a flooded area and what happened next, is almost too painful for me to write about. Thinking about it, makes my stomach squirm. The memory of it, plays in slow motion in my head, over and over again. I fell. And my camera fell with me. I feel like I’m being tested in every way possible on this journey. That night, despair took over, and while exhausted tears were silently falling down my cheeks, I fell asleep. Day 22 was a heavy day. Even though the conditions were perfect, I couldn’t seem to enjoy any of it. I was sad, tired, alone and miserable. When I got out of the national park and up on the mountain, I got signal on my phone. Not a lot, but enough to call my boyfriend. To hear a familiar voice that I could share some of my misery with, made me realize how exhausted I was. Deciding therefore to put up my tent, I spent 12 hours in my sleeping bag. It was too cold to get much sleep, but at least my body got a long break from the burdening. During the next day I slowly regained some strength and motivation. And to my great relief, the trail was well marked, so I had no trouble finding my way to the Somas cabin (Somashytta), where I had decided to spend the night. Here is where I met Lionel, whom for me, was a gift from God. We started talking, and it was clear that we both had been alone for a long time. Not only was it wonderful to socialize again, but Lionel could give me a lot of useful information about my route ahead, that he had been hiking for 26 days. It was not a coincidence that we met. Lionel: I hope you reached Alta in time for your flight, enjoy the celebrations 1st of August and good luck in China! Over morning coffee, Lionel and I were talking about faith, trust and the power of praying. We have both been praying a lot while hiking. Prayed for safe river crossings, for help to find the trail, for strength and support. Lionel felt there was a downside to praying, because he got so disappointed if it didn’t work. I said that sometimes, you don’t get what you want, but you’ll get what you need. Like that day I fell in the river, I got the gratitude of being alive and the fearlessness of crossing rivers. After saying goodbye to my new friend, I had the best day on the trail so far. Even though I was very eager to reach Kilpisjärvi, I enjoyed every step. All 52000 of them. In Finland, I constantly met people on the trail. And for every 10th km, there was a cabin. The scenery was beautiful and the trail was easy to find and to walk. 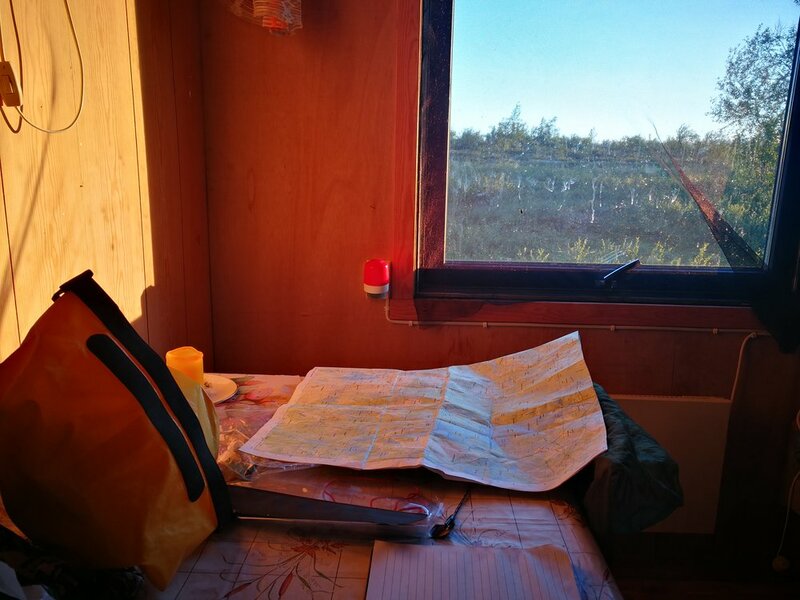 12 hours later, I was in Kuonjarjoki Wilderness Hut and slept like a baby!